Home dangan ronpa kyotaka ishimaru updates Salutations!!! Good day to all my buddies! First of all, thank you for visiting Fantasy Fan Leogan. This blog was created to bring maximum entertainment to bored, curious, suggestive, imaginative and sparkling minds out there. As of now, I won't be able to call it the "Ultimate Entertainment Blog" for otakus but I have great aces set aside in order to make it big. Though these huge plans are still in the cooking pot, it doesn't mean that I'll leave you with some junky contents in the beginning. 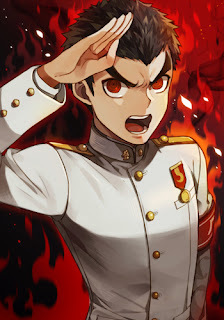 Kyotaka Ishimaru of Dangan Ronpa welcomes you with a salute. Let me take this as an opportunity for a small introduction. The name of your master blogger is Leogan and I am 22 years old as of this writing. I have proclaimed myself as a freak in multiple aspects. I can be a notebook, number, imagination, control, budget, collection and game freak. With that, you can expect much about this kind of blog that I am currently working on. I am a busy kind of guy but I am pretty sure that I always have enough time when it comes to crazy things like this (like some people would say). But even so, there may be some periods when I won't be available to answer your questions or update the site at least. For these cases, I would really appreciate your patience and please continue to like and share my blog. If you have some questions, suggestions and violent reactions, feel free to contact me! Send an email to leogan.tiongco@gmail.com. Our Facebook fan page will be created as soon as great contents have landed on the surface of this freakin' blog.